Since Proxibid’s recent redesign, the site is more convenient, with one registration for all coins and currency auctions. Also, Proxibid’s enhanced search functions allow bidders to hone in on one item from different auctions. But terms of service differ from house to house. 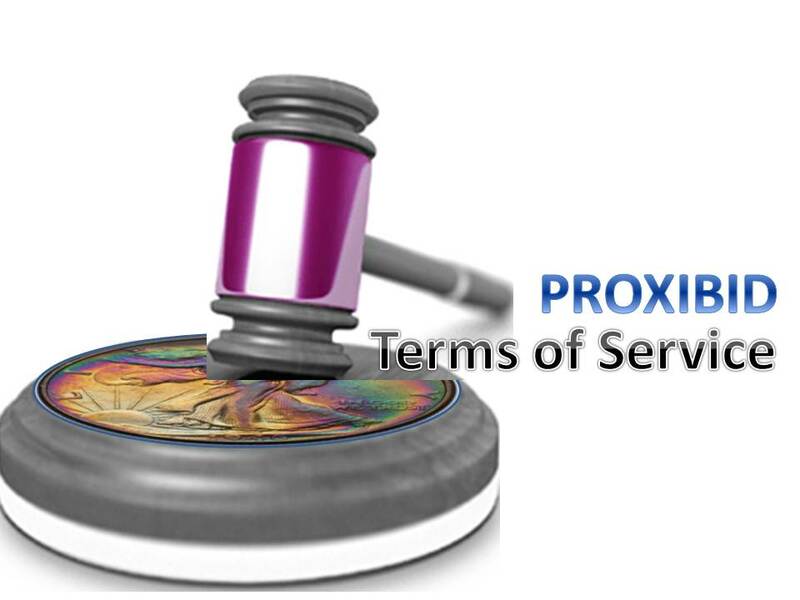 Below is a selection of service terms with a comment or two from Proxiblog. Proxiblog: Good communication about the extra pictures; alas, though, federal law (as well as the Hobby Protection Act) requires that upon being informed that a coin is a counterfeit, with adequate proof, the consignor and not the bidder is liable. Update your consignor forms and switch liability to sellers rather than your auction house. Proxiblog: Nice to know. Pacing is everything in onsite and online auctions. Proxiblog: It doesn’t make sense to sell online and then not pay for APN clearance. Eric’s Estate and Liquidation Service: “Online buyer’s premium is 13%!! On-site premium is 15%. Sales tax of 7% for any items picked up locally or shipped to an Illinois address. Most auction houses charge an increased buyer’s premium for internet bidding and no discount for absentee bids. We are different and like to encourage these forms of bidding and offer a 2% discount on our buyer’s premium for using them! Proxiblog: Bravo! Now just invest in APN clearance, and you could be one of our top houses! In the future Proxiblog will monitor terms of service and present interesting, odd or proactive terms in a round-up post such as this. This entry was posted in Featured Updates and tagged American Numismatic Association, APN clearance, Auctioneers, AuctionZip, Best Practices, Coin Auction, National Auctioneer Association, Proxibid, Proxiblog, Service terms. Bookmark the permalink.